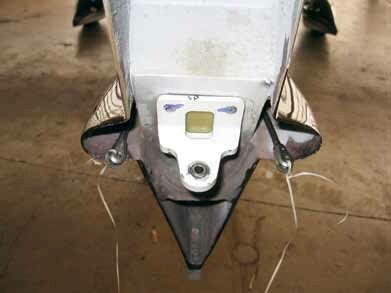 Cessumbia Rudder Hinge SB & AD | Tennessee Aircraft Services, Inc. There are some aspects of aircraft operation that get the immediate attention of the manufacture and the FAA. Anything to do with failure of a primary flight control is one of them. Two of the Cessna/Columbia/Lancair built airplanes were discovered with cracks on one of the three rudder hinges. This find prompted a service bulletin from Cessna then an airworthiness directive from the FAA. Loss of rudder control brings several thoughts to mind but I’ll leave the various possible failure scenarios to your imagination. Cessna issued their service bulletin SB09-27-01 on April 13, 2009, which calls for an initial inspection of the 300/350/400 series planes’ rudder hinges within 10 flight hours or 30 days. After that, a “rudder on” 25 flight hour/90 day inspection and a “rudder off” 50 hour/180 day recurring inspection interval is called for. Cessna allows 0.5 man hours for the rudder on and 1.2 hours for the rudder off inspections. Any hinge found with damage must be replaced. An in-service view of the top rudder hinge. Note the rudder pin just slides into the bearing mounted to the vertical fin. The mount on the vertical fin with the bearing installed is the part in question. The rudder attachment is somewhat unique in that the upper and middle hinge pins are just that, pins. There is very little force pushing up on the rudder, so only the bottom hinge pivot uses a bolt. I’m not certain about the rationale for this design but it has one serious draw back; certain failure modes of the hinge bearing could allow for rudder deflection at the pivot point. All sorts of bad would come from that. If the mount cracks and fails, it is possible the bearing could simply fall out. The hinge pin would be left with no support and cause its load to be supported by the two remaining hinges. In a traditional hinge design the hinge bearing would be captured by a bolt and nut configuration.. This would hold all the parts in place during a catastrophic failure of the hinge mount allowing for some level of continued support. The two failures represent just 0.27% of the fleet. By comparison, the FAA imposed the $45,000 wing spar strap airworthiness directive on the Cessna 401/402/414 series twins with a smaller percentage of the fleet having a failure. They only identified six damaged spars with one of those on a wing found in a salvage yard and no known history. These numbers aren’t the deciding factors but serve to show how seriously the FAA takes the failure potential. 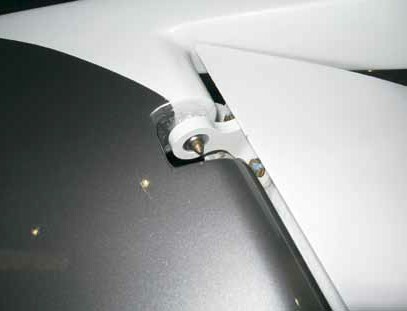 The bottom rudder hinge mount which includes the travel stop. Cessna generated the first revision to the service bulletin which added new style hinges to replace any units found damaged during the inspection. The replacement parts were a different part number which would typically be terminating action for most ADs. In this case, the defective hinges were not called out by part number in the AD, just by description. Installation of the new hinges did not relieve the reoccurring inspection requirements of the SB or the AD. The new style hinges are made of a different material and the bearings are staked in place using a different method. An interesting point about the new units is they don’t have the same area of failure near the bearing as the originals and are primed and painted. This effectively makes the inspection a moot point as described in the SB. The FAA has accepted the new parts installation as an alternate means of compliance (AMOC) for the AD on an individual application basis. There is some concern on their part about the need for checking the rigging of the rudder system after the parts replacement. Several owners have installed the new parts and obtained approval for the AMOC. Cessna published revision 2 of the SB which includes a kit to be installed on the plane, rudder travel checks and adjustments, and a method to verify the hardware installed in revision 1 of the SB are properly engaged. The kit for the 300 & 350 airplanes are p/n MK400-27-01-1 and not in stock at the time of this writing. However, Cessna’s parts department provides a break down of all the individual parts that are included in the kit. All together the list price comes to just under $1,000.00 Why they don’t toss all the parts in a bag and call it a kit – I don’t know. The MK400-27-01-2 for the 400 series lists for $737.00 and there also appears to be plenty in stock at the moment. The 400 has a larger rudder than the other models because the plane is turbocharged and needs the extra rudder surface area for stall recovery at high altitudes. Larger rudder means slightly different hinges and rigging procedures. You can continue with the original 25 hour and 50 inspection times, but Cessna financial support will end. If you act within the calendar window, which closes April 13, 2010, Cessna will install the kit and pay for it. (A no brainer). The new revision to the SB also gives notice that its full compliance is approved by the FAA as an AMOC for the AD and termination action for the inspection. This means your mechanic won’t have to apply for an AMOC using revision 1 of the SB. Cessna has already gotten the FAA to sign off on revision 2 for you. (Even less brain power required). I spoke to Gary Park about the AD and the AMOC. Gary is the FAA guy that put the original version of the AD together. He was extremely helpful in explaining some of the effort that went into this AD. To my surprise and delight, he called me back the following day to let me know the superseded version of the AD had just been sent to FAA legal. The superseded AD should include language approving full compliance with revision 2 of Cessna’s SB to be terminating action for the AD. I delayed sending this article to print as long as I could in hopes the AD would be published. Fear for life and limb, I must send this article to Kim Huntington at CPA today for inclusion in magazine as it is already 15 days late. By the time you read this, the superseded version of the AD should be published, and I hope it has the terminating action included or I’m going to look pretty silly.